FF XIV reaches 4 million players! It felt lately like FF 14 was picking up steam. Lots of people seem to be playing it, there’s queues sometimes to log in, character creation restriction at certain hours and many other signs of an MMO that’s doing well. Just myself I’ve been spending more and more time in-game lately to the point where I’ve considered things like skipping work to get in a few more hours of game-time (I have resisted thus far…). Not since Vanilla WoW had this happened to me. Well now we know how well the game is doing and the magic number is 4 million players, an increase of 1.5 million on year according to some sources. Of course, of these 4 million we don’t know exactly how many are active players, free trials and so forth but an increase is an increase and my in-game experiences do fit with a game that is growing. To celebrate, Square Enix is offering a free weekend to everyone who wants to try the game. As to the why it’s always hard to explain but I think the game is reaching a nice maturity and the frequent updates featuring lots of content helps keep people occupied and playing the game. Most of its constant is accessible if you’re willing to put in some time and I think that plays a big part in the game success, people don’t feel locked out of doing what they want. Even raiding is pretty accessible thanks to tools like Duty finder and Party finder. Congratulations to the FF 14 team and may Heavensward send these numbers even higher. The information in this post reflects the state of the Kickstarter at the moment of publication. Edit: Information has been added to the KS page in the FAQ section about some of the concerns expressed in this post. So there’s been a lot of talk around lately about Crowd-funding, about accountability, about hard-nosed interviews and games development. There’s a group of people, myself included who see game crowd funding with a suspicious eye and on the other side there’s people defending the model and saying we should not judge based on a few bad apples and that overall, game devs are doing their best. I won’t hide that the discourse about how game devs are doing their best and that we should not pass judgment based on incomplete information or a lack of understanding of the game development process is bothering me. When I’m being asked to fund a project, I do have to make a decision on whether or not it is a good investment and I believe it is the responsibility of the developers to give me that information if they want me to fund them. Something that is often lacking. I’m not going to make friends in the game industry today with this post but I feel I need to illustrate my reasoning as to why I will not fund a game. And in today’s example, we will be talking about Crowfall, a new MMO project who just arrived on Kickstarter. So, let’s see what Artcraft, the developers tell us about Crowfall. Well, there’s a very long description of what the game will be about which is awesome since it would be a bit silly to fund a game I wouldn’t want to play in the first place. On that regard, I give A+ to Artcraft. I feel reading their description I have a good idea of what the game is about. They also do a good job of presenting the team and their past work. So A+ again there, I know who I am dealing with. Funding wise, they want to get 800 000$ dollars and the video tells us that they have some personal money invested already. I would have liked to have seen this written in the description and also how much do they have invested already. How much of the total does 800k represent? Do they have other funding that they did not talk about? I would also like to know the total budget of game. On that aspect I will give a D- to Artcraft. Not a complete failure but there’s too much info missing. Tying in the previous point, we have no idea of how far along exactly development is. If alpha is late summer we can deduce work has been done and the videos would suggest it but really, no solid information is given so we have no idea. The videos could be either gameplay or just video and we have no way of telling. Timetables are also lacking. They write they plan to be in Alpha by late summer 2015 but beyond that… no real info. I’m giving F here, I would have liked to know when to expect the game to be out. Right now I have no idea of their planned timetables beyond an alpha date. Lastly, risks are also a bit generic. They tell us it’s going to be very difficult and risky, they tell us that times are subject to change and then they jump into commitments. I wanted to know the risks they foresaw in more specific terms. Right now all I have is making games is hard and times can change… generic stuff that doesn’t tell me anything. F again. If you look up investment guides (and we are investing in a game) they recommend you do your own research about the product and individuals behind it before making a decision and since I find that the information given is lacking in a few key areas, let’s do our due diligence and investigate. The game itself is well explained I feel and won’t need much research. They do admit that there’s a high risk since they’re creating something new not attempted before so it’s something to keep in mind in regards to what this entails. I think delays are to be expected as some things are ironed out and in worst case it could lead to the game not seeing release or seeing release with significant changes meaning a key feature we like won’t be present. The people behind the game now. This is the leap of faith part I feel. Both producers and the whole team have experience on big titles and quite a few releases so we’re not dealing with inexperienced people which is good. On the flipside, quite a few of the titles named , Shadowbane, Star Wars galaxies, Warhammer Online (team), Dark Millenium (team) and the Sims Online to give examples have had troubled histories when not outright cancelled or reinvented. So it’s something to keep in mind that the people behind Crowfall don’t have perfect records up to this point. That said, they might not have been individually responsible and people can and do learn from past mistakes. This is why I say it’s a leap of faith. It could could well, it could go wrong but it’s not a sure shot by any means. Funding is where it gets suspicious. They have shown a team of 17 which, according to the average indie salary for 2014, would cost 850k to fund for a year. Alpha is 5 to 6 months away and based on past game it will be likely a year between alpha and release at least. So right there they are short on funding which is a big alarm for me. Yes they said they had private funding but we have no idea how much of that is left so it could be that they need the KS money to keep going. We don’t know and that for me is a huge problem. They’re asking me to fund a game that if I’m to trust the info I have, is already lacking funds to complete. The last three items, schedule, advancement and risk tie into the funding problem. I have no real idea of the advancement of the project so far and launch date. For all I know there could be years away.. no way of knowing and the only risk that is listed is that delays are likely. Not good news when the project is already under funded. So based on my research, the risks of this project are extremely high. A new concept that seems underfunded with no clear delivery date. I know that some people will want to counter this post by saying I haven’t done enough research, that I don’t understand the realities of game development, that I don’t understand the goal of Kickstarter. You know what? That is exactly the problem! The fact that the Crowfall Kickstarter doesn’t tell me enough forces me to do research and estimate by myself if I think it’s a wise investment or not. I shouldn’t have to do that. The Crowfall team should have done everything in their power to prove to me how reliable and serious they are, how they were going to make the game and make sure it would launch in a timely manner and with enough funding to see it through. FFXIV Monday: Now with more Animus! These past few weeks I’ve been writing about what happening in my corner of the world in FFXIV and in the tradition of the old Lotro Wednesday I used to make I’ll try to make this a recurring thing. Quite a few things happened since last Monday so let’s get to it with first, the bucket list. Black mage to 50: I made some progress this week! One whole level which brings my Black mage to 31. I need to set time aside for this. Coils of Bahamut: No progress this week as I was mostly focused on my zodiac weapon and farming World of Darkness. Extreme primals: Ramuh is down!!!! That took a while but I finally managed to get a group that knew how not to fall apart. Ramuh is a pretty technical fight and gear won’t help you if it’s not well executed which explains in part why it took me a while to find the right group. Now only Shiva EX remains and I’m hoping that since she’s current content it will be a bit easier to find groups. 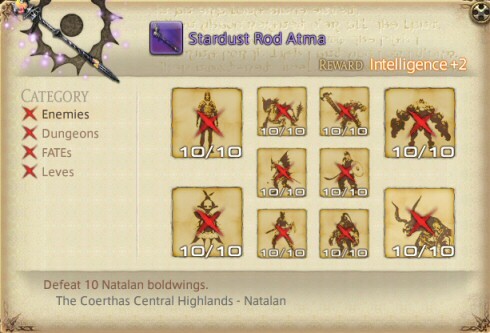 Zodiac weapon chain: I’m now done with the Atma step!!! I spent a lot of time last week grinding out the last three books and now I’m on the Animus step since yesterday. I had enough Soldiery tomes to jump ahead to the melding step and I did manage to get one meld done. Only 74 more to go. Gear wise I’m also coming to the end of my catchup. I need to replace my pants and that will be done through Poetics tomes. I don’t feel like farming WoD for a single drop and besides, since I’ll now be running Ex roulette daily I should have the required tomes in a week. I’ll also have full augmented accessories this week once I complete the weekly quest for Carbontwine. The only real piece missing will then be getting my weapon to iLvl 110 and that will be done once I complete the Animus step of the Zodiac weapon. Long story short, I’m nearly done with gear catchup. This week I’d like to get one or two levels done on the black mage at least and I figure a lot of time will be spent on hunting Alexandrite so I can do melds for my weapon. Still, I’ll try to give Shiva a look but with the Gold Saucer coming out Tuesday, I don’t know where I’ll find the time to do everything. I give up… go read this interview by John Walker of Rock Paper Shotgun. It’s not a super fun read but it’s an important one and it’s the best example I could ever give of why I’m not funding anything anymore on Kickstarter and why…I better stop here…. I’ve been trying for nearly a week to write about this interview and I can’t. I’ve gone from murderous 3000 words essays that could get me sued to more subdued but confusing posts and nothing is working out. Again just go read it if you haven’t already, I think it’s important that gamers be aware of how some game creators think. Three weeks ago I made a post outlining my main pre-expansion goals for FF14 and I figure now is a good time as any for an update. Complete coils of Bahamut : Attempts have been made to complete turn 7 but no luck so far. This is a fight that requires everyone to pay attention to mechanics and you can’t brute force it. I get a feeling duty finder might not be the best tool for it. In fact I’m suspecting that going forward I won’t kill anything with a DF group without really lucking out. Finish Extreme modes: Odin went down so now it’s down to Ramuh and Shivah. I did try my best to get Ramuh and came close twice but I’m still missing the kill. I might try to gather guildies again for another try. I’ve also been on the lookout for groups advertising. Get black mage to 50: No progress there. I’m keeping this for later. Finish the Zodiac weapon upgrade quests: This is where the major part of my time was invested. I’m now starting book 7 (I was on book 2 last time) and I’m starting to see the light at the end of the tunnel. I know the next step is no cakewalk either but it will feel good to be done with a big step. The short version is I killed Odin and finished five atma books in three weeks. The longer version is that I spent a good amount of time gearing up and doing a few odds and ends in order to be able to make serious attempts at Coils. I went from iLvl 101 to 110 which is a lot considering I’m getting into the higher range of gear where upgrades are harder to come by. I’m missing two pieces to have a full demon healing set and one more Poetics piece to buy. I should still have a week or two of gearing ahead but after that I’ll be able to focus more on clearing those goals. I’ve been asked a few times about what the atma books are and what’s the deal with the Zodiac weapon. I might do a more complete overview of the quest at a later time but for now I’ll do a quick resume for the non FF14 players. When you get to level 50, one of your options to get an endgame weapon is to complete the Relic weapon quest which gives you an iconic weapon for your class that is good enough to start doing endgame stuff. The early Relic weapon quest is somewhat involved and requires a few dungeons runs, some crafted components and two trials fights but you end up with a great weapon that was pretty much the go-to endgame weapon back when the game released. With each progressive patch that raised the ilvl of content, the game added quests to upgrade your relic weapon and keep it up to date with the content coming out. However with each step released came a convoluted and often grind intensive quest to upgrade said Relic weapon. Each step also renamed the weapon so that it became Relic + 1, then various versions of Atma and now Zodiac which explains the various names you might see. The idea behind the Zodiac weapon chain is to offer a slower, but less luck dependent (some will argue that point), alternative to grinding bosses hoping your weapon will drop. It’s also a good way to have a weapon that while not always BiS, is pretty close to it. The alternative, going after boss weapon might mean that you’re stuck with a weapon for a long time before seeing an upgrade. Why am I doing it? Because it’s FF14 version of the legendary weapon, simple as that. It’s nice that it also happens to be a good endgame weapon but the real reason is being able to say that I own an awesome weapon that people will recognize. It might be petty but I don’t really care.